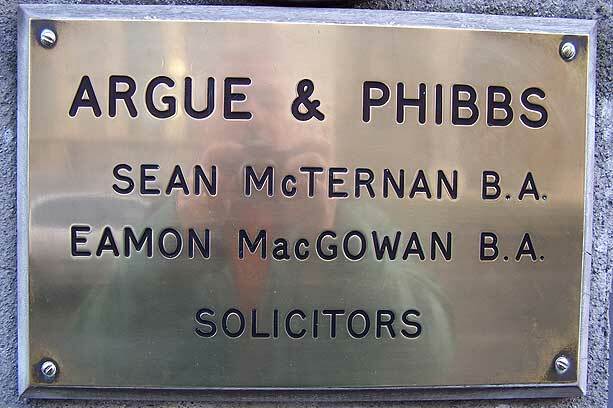 Funniest name for a firm of solicitors in Ireland? Sligo Town on the Net has more on this wonderfully named firm. A man has been prosecuted for putting offensive and obscene messages on social networking site Bebo in what is believed to be the first case of its kind to come before the Irish courts. Paul Anthony Matthews (27) posted what a judge described as "outrageous" messages on a teenage girl's site on January 31 this year. Matthews, of Carnbeg, Doylesfort Road, Dundalk, agreed to pay the victim €3,000 instead of going to jail. The pioneering case was brought under Section 13 (1) of the Post Office Amendment Act 1951 for sending offensive or indecent material by means of telecommunication. Matthews, a father of one, admitted posting explicit and abusive messages on the teenager's site. The victim cannot be identified because of a court order. Dundalk District Court was told that Matthews had a previous disagreement with the then 16-year-old and posted the messages on her Bebo page. The teenager had made a complaint about Matthews to gardai regarding another matter and the Bebo messages were investigated. Matthews was arrested and admitted when questioned that he had put up the messages on her site. So what's the significance of this case? It's certainly not the first time that internet harassment has come before the courts in Ireland - as far back as 1999 a man was convicted of criminal libel for online postings (Mac Ruairí, “Man Jailed for Libel on the Internet”, Irish Examiner, December 21, 1999.) But it does seem to be the first time that this particular section has been applied to the internet, so it might be worth looking at it in more detail. “Offences in connection with telephones. (a) if tried on indictment, to a fine not exceeding €75,000 or to imprisonment for a term not exceeding 5 years, or to both, or (b) if tried summarily, to a fine not exceeding €5,000 or to imprisonment for a term not exceeding 12 months, or to both. (3) A contravention of this section is an offence under the Post Office Act 1908. (4) On convicting a person for an offence under subsection (1), the court may, in addition to any other penalty imposed for the offence, order any apparatus, equipment or other thing used in the course of committing the offence to be forfeited to the State. (5) In this section, ‘message’ includes a text message sent by means of a short message service (SMS) facility.”. The purpose of amending the Post Office (Amendment) Act 1951 was to increase fines to deter nuisance calls to the emergency call answering service, ECAS. The change proposed by the Senators is a wider offence and I understand from the debate on Tuesday that they are particularly concerned about tackling cyber bullying. The issues were raised again today by the Senators. This type of regulation falls outside the remit of the Bill. The sole intention of this provision is to address nuisance calls to the emergency services. I have listened carefully as did the Minister, Deputy Noel Dempsey, to the points raised by the Senators. The purpose of the Bill is to deal with the regulation of a service. The areas raised by the Senators would be more appropriate to the Department of Justice, Equality and Law Reform. To respond to Senator Terry, it is an offence under section 10 of the Non-Fatal Offences against the Person Act 1997 to harass a person by use of any means, including by use of a telephone. Therefore, the issue is already dealt with to a certain extent. Consequently (though bearing in mind we only have media reports to go on) it's hard to see how this section was applied to the defendant's conduct in this case. Instead, one would expect this type of situation should be dealt with (if criminal charges are necessary) by the offence of harassment under section 10 of the Non Fatal Offences Against the Person Act 1997, which explicitly includes communication with a victim "by any means". At this point one might wonder - so what? Does it matter whether this conduct is dealt with under one of these offences rather than the other? I'd suggest that it does. Section 13 is designed to deal with nuisance telephone calls. These are peculiarly direct, immediate, personal and invasive of one's privacy. Consequently the law applies a low threshold - a single instance of gross offensiveness - before these become criminal. But this is very unusual. The law doesn't generally criminalise mere offensiveness, even gross offensiveness, nor should it. But if section 13 were extended to all internet communications then it would have just that effect - prohibiting a great deal of speech on the basis that some readers might find it grossly offensive. (Something which would, for example, make criminals of those who post the Danish cartoons portraying Mohammed.) Indeed, as Eoin O'Dell recently reiterated "It is precisely to allow the expression of offensive opinions that the right to freedom of expression is necessary." Having said that, there may be a case for extending section 13 or a similar provision to some internet communications. For example, nuisance emails and instant messages share many of the characteristics of text messages, and in some circumstances messages left on a person's social networking page might be as invasive. But any extension of the law must be carefully limited to avoid damage to freedom of expression. Update (10 May 2010): - I've now been informed that after being alerted to these issues the original trial judge accepted that there was a flaw in the proceedings, declared a mistrial and reentered the matter. Last week, on the matter again being listed in Dundalk Judge Hamill considered this point and ruled that the charge was inappropriate. A 19th Century Irish judge (Sir James Mathew) once said that "In England, justice is open to all – like the Ritz Hotel." Unfortunately, litigation has not become much cheaper in the meantime. But other aspects of the law have. In particular, there has been an explosion in the number of high quality books on law and technology available for free download - both free as in beer and free as in speech. Here are some of my favourites. Free Culture is one of the more influential books on the use and abuse of intellectual property law and at the same time manages to be both readable and entertaining. Code 2.0 scarcely needs an introduction. Lessig's analysis of how code can be used as a form of regulation, and the risks this presents, was an instant classic when first published in 2000 and this second edition confirms that many of his insights have become increasingly relevant in the meantime. The Future of Ideas is another classic - covering much of the same ground as Code and Free Culture, it looks at what he calls the corruption of the values of the early internet, an internet counterrevolution which threatens to stifle creativity and innovation. Building squarely on Lessig's work, Johnathan Zittrain's The Future of the Internet - And How to Stop It is a perceptive discussion of how the innovation and freedom permitted by an open internet is under threat from increasing restrictions both on the network itself and the devices which connect to it. On a similar topic is Matthias Klang's doctoral dissertation, Disruptive Technology. He argues that new technologies "disrupt the, previously established, social norms that make large parts of our democratic social interaction" while simultaneously the regulation of new technologies may undermine democratic participation, for example by imposing contractual restrictions on speech online which would not apply offline. The Wealth of Networks by Yochai Benkler covers some of the same ground, but has a different focus in arguing that a networked environment and a growth in the sharing of information (such as via Creative Commons licences) brings about deep, structural changes in society - notably a shift from markets to non-market social behaviour - which face resistance from a variety of entrenched incumbents who stand to lose out. Turning specifically to privacy, Daniel Solove's The Future of Reputation is a superb look at the interaction of privacy, reputation and freedom of expression on the Internet, and takes a broad view of how social mechanisms such as shaming might develop online. Perspectives on Free and Open Source Software, edited by Joseph Feller and others, is a collection of essays covering a wide range of issues such as: the motivation of contributors to open source software, the security issues it presents, the business model underlying it, the challenge of open source for the legal system and the application of open source / free software principles in the world of science. This remains possibly the best introduction for anyone (lawyer or not) curious about free / open source software. The OSCE Media Freedom Internet Cookbook is another must read. This collection of essays by various authors offers some very interesting perspectives on the challenges of reconciling individual and media freedom with regulation of the internet while also covering a variety of topics from "hate speech" to internet hotlines to education for media literacy. In particular, Gus Hosein's piece on the Open Society and the Internet is a perceptive look at the promises of and threats to internet freedom. Last, but certainly not least, is a collection of essays by the individual who started many of these debates about opening software, knowledge and society. 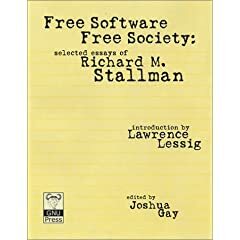 Free Software, Free Society: Selected Essays of Richard M. Stallman includes classic pieces such as "The right to read" and "Why software should be free".